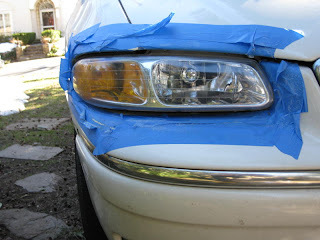 Today I used the Sylvania Headlight Restoration Kit on my friend Brandon's Chevy Venture van. (It was actually his Mom's van.) The van has about 230,000 miles on it, making it a good vehicle to test the kit on. Of course the headlights already had a lens restoration done on them 1 year ago. Still that restoration has worn off and left the headlights in bad shape again. You can see in the pictures below they are still cloudy and hazy. Cloudy headlights reduce your ability to see clearly when you have your lights on a night and makes it more difficult for other drivers to see you as well. Having cloudy headlights is really a safety issue and not just an appearance annoyance. I would keep this in mind if you have a vehicle that has hazy, cloudy, or yellowed headlights. Overall the Sylvania kit took me around 1 hour and 30 minutes to use. I give it a “Good” rating as there are improvements that could be made. The kit should have included an extra sheet of 600 grit sandpaper. 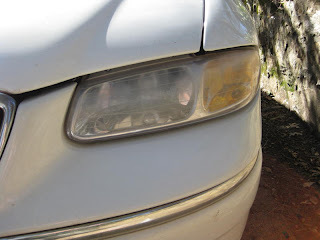 If you have large headlights that are are seriously cloudy you might need to do more sanding than suggested, for instance the right-hand headlight needed more work. (I timed doing each side evenly from the instructions.) For the Venture the amount of sandpaper was adequate, but as the instructions stated you do need to cut the paper in half to make sure you have enough for doing each headlight. The instructions could have been printed on slightly sturdier paper and been a bit larger. I found it difficult to read the tiny print while doing the restoration. What did I like about the kit? Compared to the 3M kit I tested on my own Mom's Van about 1 year ago, the Sylvania kit has a UV Clearcoat. As far as I know Sylvania is the only company that sells these kits with a UV Clearcoat. This is important as this is what will protect your headlights from getting cloudy and hazy again. The Slyvania kit might last longer because of the UV Clearcoat. Only time will tell! The 3M kit did come out better when I used it because that uses a drill. The Slyvania kit you do by hand, but it worked well and did not take nearly as long as I thought. Brandon and I were pleased with how the Sylvania Headlight Restoration Kit worked and felt it was definitely worth the time to do it. Would I recommend it… yes I would. Why? Simply because of the UV Clearcoat. If your headlights were seriously cloudy, yellowed, or hazy… I might recommend another kit though as I do not see doing it by hand would work. Overall we both were pleased. It definitely will help Brandon and his family drive safely in the van. If you are interested in buying a kit, they retail for $20 and are sold in most auto parts stores. 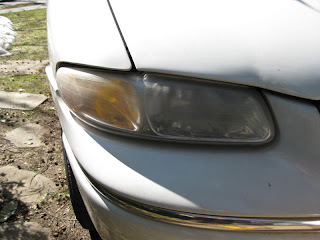 In my last post I suggested using Toothpaste to Restore Cloudy Headlights. It will work…. if you spend the whole day doing it! To save yourself time and sanity I'd suggest buying a 3M Headlight Restoration Kit. These kits range in price from $15-20, and generally work well. For restoring the headlights on my Mom's '97 Chrysler Town & Country I bought the 3M Headlight Restoration Kit. It took me about 4 hours to do it properly. The process is basically what a body shop would do to restore and refinish headlights. Except you use a drill and save a ton of money since you DIY! Here are Pictures of the Before and After on my Mom's '97 Chrysler Van. Restoring your headlights is extremely beneficial for your safety and other drivers out on the road. Not only did this improve the appearance of the van, but the ability to see the road at night and in bad weather greatly improved and other people will be able to see the van better. It's possible the headlights will get cloudy again, meaning I might have to buy another headlight restoration kit and redo this. If you want to avoid this in the future I would recommend going down to your local auto parts store and buying a UV clearcoat spray in a can. Headlights that come from the factory have a UV clearcoat protection on them, which helps protect from UV damage and debris. Generally when the UV clearcoat wears off is when you start to get cloudy, hazy, and yellowed headlights. The 3M Headlight Restoration Kit doesn't have any sort of clearcoat spray that comes with the kit. Some kits, like the Slyvania Headlight Restoration Kit, come with a UV clearcoat application. I should put a protective UV coating on the van's headlights, to ensure I don't need to refinish the headlights again. I would recommend you do the same if buy the 3M kit. I was oversanding with the 600 grit sandpaper. The paper would gum up, before I realized it. It probably would have been helpful to wet the 600 grit paper a little bit every so often. You get only 1 piece of 3000 grit sandpaper. It would have been helpful to have 2 pieces in my opinion. I did one headlight then I moved onto the other one, but by then the paper was used up. It took me forever to do the other headlight. I would suggest switching back and forth on each side if you are headlights are really cloudy, hazy, or yellowed. 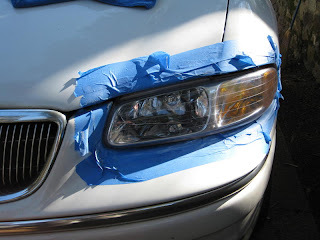 You must Tape-up around your Headlights! I probably would have done a lot of damage to the paint if I didn't! I just used blue Painters Tape you can buy at any local hardware store, which worked fine. I would suggest using a Corded Drill, which is what I used. If you try to use a Battery Powered Drill, I'm sure the battery will run out before you finish and you will be waiting for the batteries to charge. As the video says in the beginning you definitely should have a Spray Bottle and some microfiber towels. I hope this helps people restore their own Headlights. If you have seriously cloudy, hazy, or yellowed headlights keep in mind the 3M kit probably will not work. You might need to get them refinished and restored at a body shop. However, it is worth it to at least try the 3M kit first since it's not that expensive. I'd imagine your headlights will still look a little bit better. If you have any questions about using the kit please leave a comment below.